Typically a smaller school affair, the 2018 Berkeley Prep Invitational drew 37 teams and some big-school powerhouses. 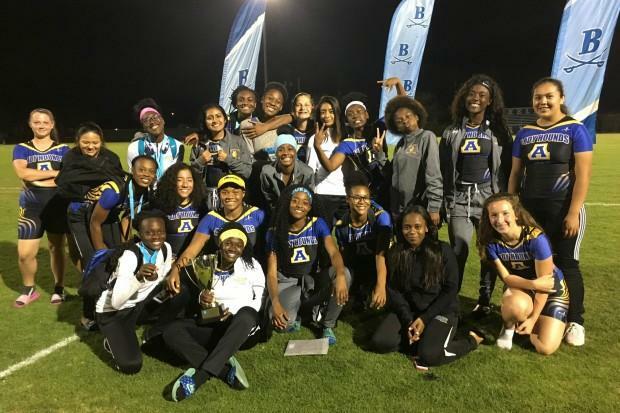 Polk County's Auburndale girls along with the George Jenkins boys won team titles on Saturday. For Auburndale, the Lady Hounds nearly doubled up runner up Plant 120.5 to 62. Host Berkeley Prep was third with 55.5 and Admiral Farragut fourth with 52. On the boys side, George Jenkins comfortably out-paced runner up East Lake 155 to 97. Sarasota was third with 77. Driving the Auburndale train was freshman Tyra Thomas, who scored 28 points on her own and was named Most Outstanding Female Athlete. Thomas and teammate Cathrina Morris were battling in the fast heat of the 100m hurdles when Morris kicked a hurdle and broke her stride. Thomas did not and won the event with a meet record 14.73, not far off Olivia Welsh's stadium record of 14.60. Thomas also came in second in the triple jump at 34-11(10.64m) behind Sickles' Kitan Adeniji's 35-10.75(10.94m). To cap the individual feats, Thomas also won a hard-fought 300m hurdle heat over host Berkeley's Chloe Davis 45.39 to 45.66. "I'm happy I was able to come out here and do my best," Thomas said. "I'm a competitive person but I also try to stay humble." It was far from a one-woman show, the Lady Hounds got contributions across the board. Morris came back in the 300m hurdles and took third. Freshman Victoria Morris grabbed second in the high jump 5-1.75(1.57m) behind Lakeland Christian's Sydney Cabrera at 5-3.75(1.62m). 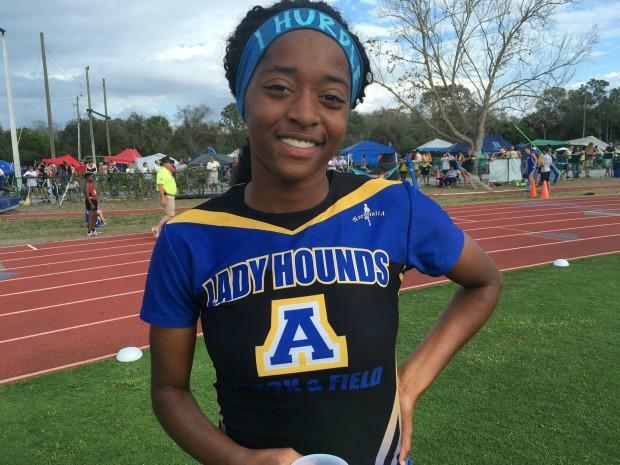 "She (Victoria Morris) had never even high jumped before," Auburndale girls coach Sheryl Thomas said. "She just finished with a regional basketball game on Tuesday, we got her on Wednesday, went over some basic techniques and she was hitting almost 5-2 today." 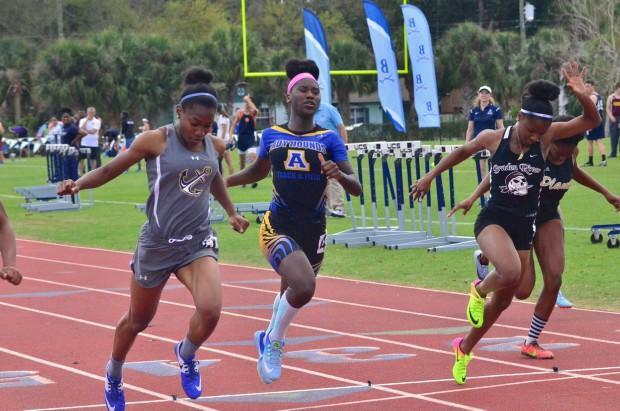 Saniya Tillman, another freshman for Auburndale, won the 100m with a meet record 12.20 out of the fast heat, just in front of Admiral Farragut's Jazmine Alderman at 12.27. Teammate Kyndell Burrows was third at 12.40. 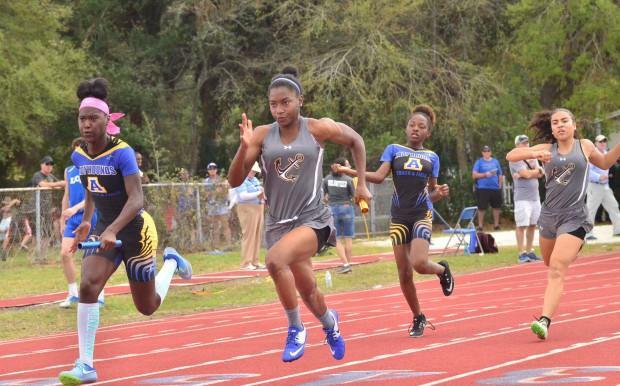 Burrows would win the 200m event with a meet record 25.28 in front of Braden River's Breonna Graham at 25.43. Alderman took third in that event (25.56). Thomas also praised the efforts from Anasia Gainers who set personal bests in both long and triple jump, taking third in both events. "All around from throwers to jumpers to middle distance, everyone played a crucial part," Sheryl Thomas said. "Even with several injuries across the board everyone did a really good job." 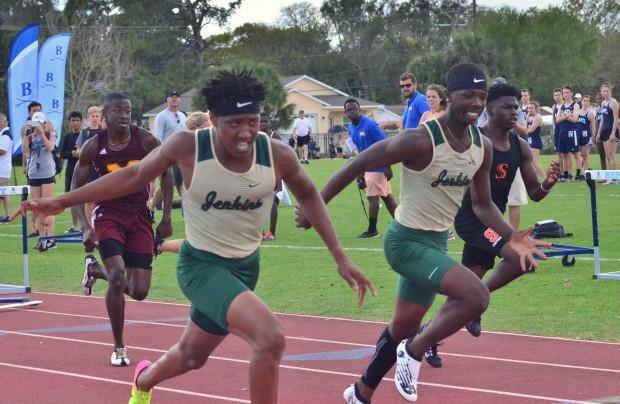 On the boys side, George Jenkins was floated by a pair of multi-talented athletes in Tyson Williams and Damarcus Sneed, both sophomores. Williams and Sneed went 1-2 in the 110m hurdles, Williams with a 14.98. The pair took second and third in the 300m hurdles behind Middleton's Neville Salmon at 40.42. Salmon was third in the 110m hurdles. "We have a lot of good depth," Jenkins boys coach Brian Robichaud said. "We were able to put a lot of kids in the 4, 5, 6 range. We're also young, sophomore-heavy with a lot of potential but also a lot of work to do." Behind Williams and Sneed, the Jenkins boys placed runners in the hurdle events, they picked up points in the 800m and 1600m. Jordan Domineck won the discus at 141-10(43.24m). Teammates Ryan Gutierrez and Andy Labrada took third and fourth, respectively. "We scored in every field and running event," Robichaud said. "We're well-rounded, there's not a spot where we're weak." While Thomas took home top individual honors on the girls side, Admiral Farragut's Phillip Henderson won Most Outstanding Male Athlete. 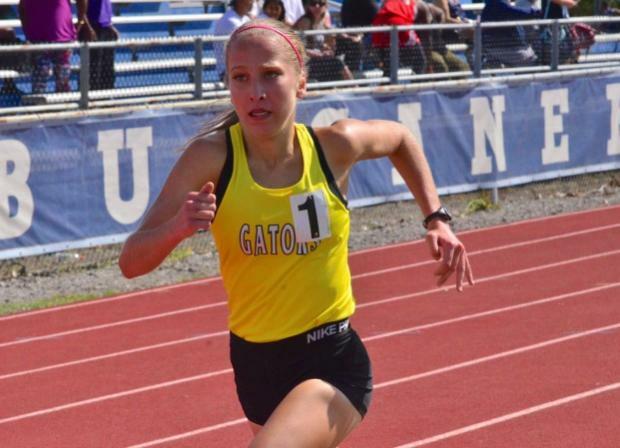 Henderson won both the 800m and 1600m on Saturday and it did not come easy. Jenkins' Brady Zimmerman controlled the 1600m race, moving into the lead after the second lap. Zimmerman made a move to separate from the pack and Henderson went with him. On the final lap, Zimmerman made two attempts to shake Henderson, one on the back stretch, one on the last turn. "I knew I could push and go all out the last 150 meters, so I would kind of play with him (Zimmerman) and try not to waste energy," Henderson said. "Once I hit that last 100 meters, I really picked it up." That's when Henderson moved in front and won it in a personal best 4:31.57. 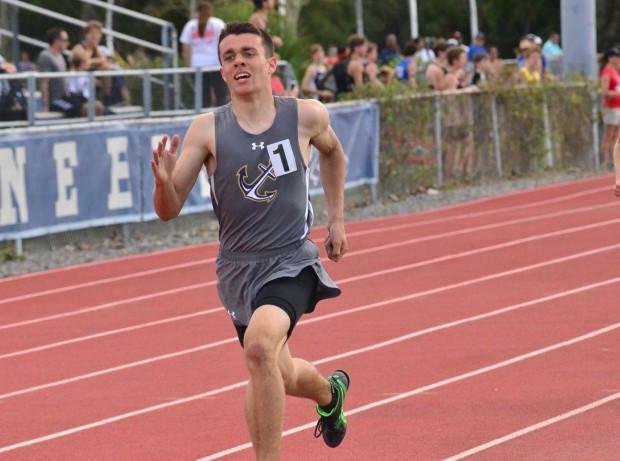 Henderson pulled a similar scenario off in the 800m race, taking Sickles' Mason Goodman on the final turn of the second lap to win it in 2:02.04. It must have been extraordinarily difficult to choose the meet's Most Outstanding athletes. Land O' Lakes' Natalie Abernathy dominated the longer distance events with a 5:12.11 to win the 1600m and an 11:20.96 to win the 3200m. Abernathy basically ran the 3200m on her own, leaving the rest of the field behind by the fifth lap. However, she got a challenge in the 1600m, even if she didn't feel the pressure. Plant's Grace Summers pushed up from fourth into second and was just a little more than two seconds behind Abernathy at the finish. "With the wind on the back stretch and crowd cheering on the home stretch, I didn't really feel anyone closing in on me," Abernathy said. "In a race like the 3200, when I'm by myeslf, I try to imagine there's someone in front of me that I have to catch." 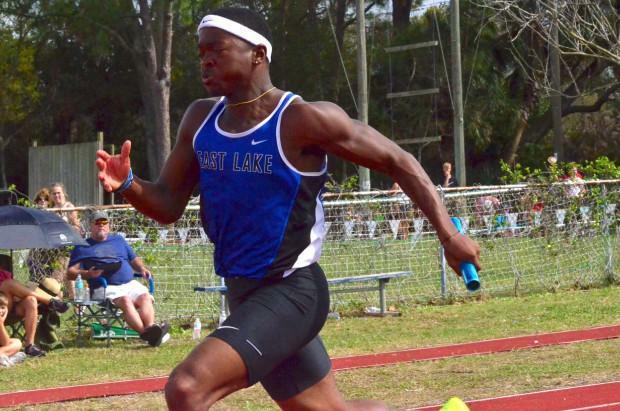 East Lake's Joshua Bowers had a huge day, winning the 100m in 10.80, just in front of Spoto's Derrick Curtis at 10.84. East Lake's Micah Abraham was third at 10.93. Bowers and Spoto's Antonio Barnes dominated the sprints. Barnes would take the 200m in 21.92 with Abraham in second at 22.21 and Bowers in third at 22.30. Barnes, in his first action in the 400m, won it in 50.72. Pasco's Mario Watson was a close second at 50.76. "I want to hit low to mid 20s in the 200 and mid 40s in the 400 this year," Barnes said. Barnes is a state placer in the 200m (7th) and looks to be shifting his athletic endeavors to track after focusing on basketball for years. Tendinitis hampered his basketball career but Barnes says that for some reason it doesn't bother him in track. Bowers' big moment came in the 4x100m. With Spoto leading through the second leg and Sarasota leading through the third, Bowers got the baton with some work to do. "I knew my teammates had my back, even if we weren't in the lead, they'd put me in striking distance," Bowers said. 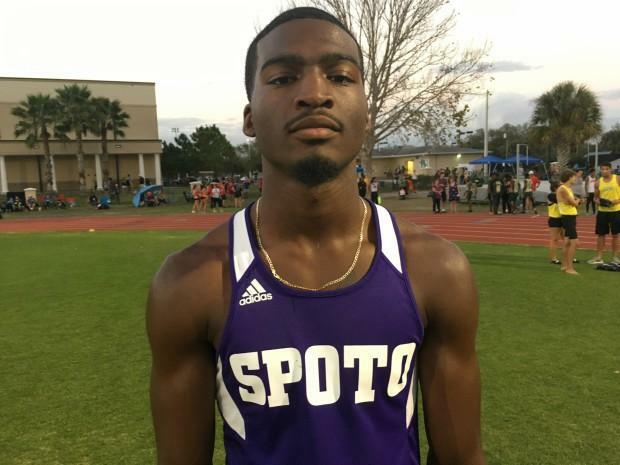 Bowers mowed down both Sarasota's and Spoto's anchor legs in the last 100 meters to win it in 42.76. Spoto was right there at 42.79 and Sarasota also right there at 42.82. The relay was one of the more fantastic races of the entire day. 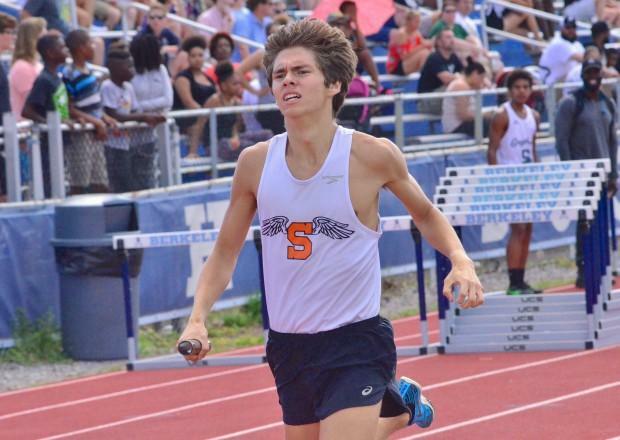 A face that track fans might want to get used to is Sarasota junior Charles Ward. Ward didn't even compete as a freshman and sophomore, focusing on football and weightlifting. He decided to come out for track in 2018 and try an event he'd competed in during middle school. He's come out with some pretty good results. A 22-8(6.91m) won the long jump for Ward but Ward hit a 23-4.75(7.13m) at George Jenkins just the week prior. 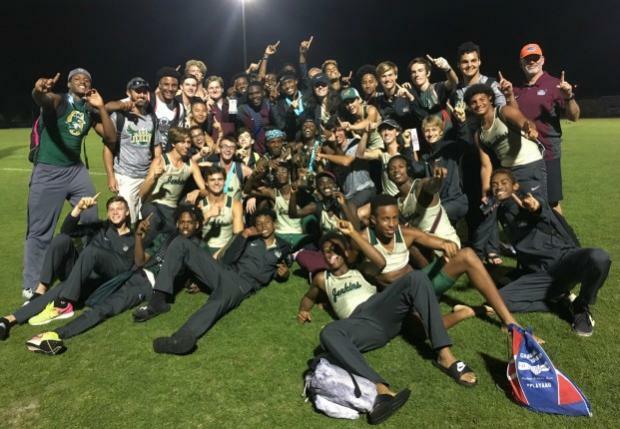 That mark led the state of Florida until Sebastian River's Queshun Watson-Riggins topped it last Friday at Merrit Island. Ward is an athlete to keep an eye on for the 2018 and 2019 seasons and has a very high ceiling with his growing familiarity in the event and sport. Kicking off the running events of the day was a great showing by the East Lake girls 4x800m relay. The Eagle relay consisted of Parker Valby, Emily Rollins, Riley Fitzpatrick and Isabella Pawloski. The girls actually trailed the Jenkins relay by six seconds during the second leg but closed to within three by the second exchange. Fitzpatrick's leg put the Eagle girls in the lead but the Jenkins girls took it back before the final exchange. Pawloski snatched the lead back on the first turn and slammed into the second turn of the first lap to open up a lead. The lead stretched to eight and then 10 seconds coming around for Pawloski's second lap. The 9:50.13 was a meet record and significantly faster than the 10:05 the same quartet ran at the Early Bird Invite. Sarasota's Ben Hartvigsen led the boys 4x800m relay with a 1:58 split on anchor to win the event in 8:20.04. Alan Romero, Adrien Zambaux and Shane Kilduff rounded out the team in their first race in that configuration. 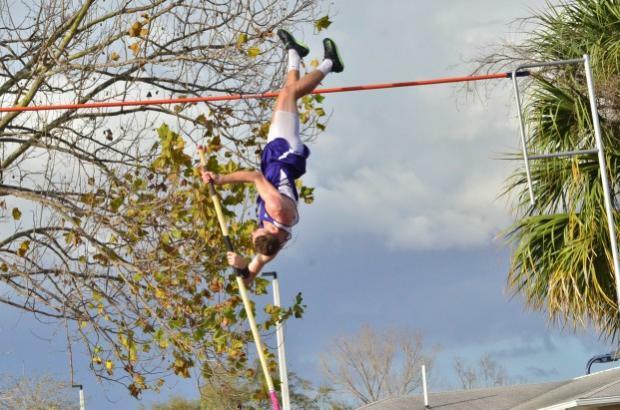 Top pole vaulters in Seminole's Katie Brantley and River Ridge's Stone Baker were dominant in winning their events, even if they fell short of their more lofty goals. Brantley, whose 11-7.75(3.55m) from 2017 stands as a tremendous mark, it's also one she's encountering difficulty finding again. She won the event on Saturday with a 10-6.25(3.21m) and could not quite get the 11-2.5 she tried for with her final vaults. "It's difficult and I think I'm pretty hard on myself but I still am hoping to hit 12 feet this year," Brantley said. On the boys side, Baker won it at 14-11(4.55m) but missed on his tries at 16 feet. Not to worry, Baker hit 15-10(4.83m) at the Early Bird Invite and that leads the state of Florida in the early part of the season. "I'm still progressing, so I'm positive about it," Baker said. Baker, now a senior, is starting to get looks from colleges. He said that he's entertaining offers but likes the idea of competing for home town USF. Plant's Avrel Jean won the 400m in 58.91. Farragut's Faith Nelms laid down a big performance on Leg 2 of the 4x100m, setting up Alderman to come through with the win in 48.96. Auburndale's relay was right there in 49.01. Jenkins' Alicia Ruiz won the girls 800m in 2:22.78. 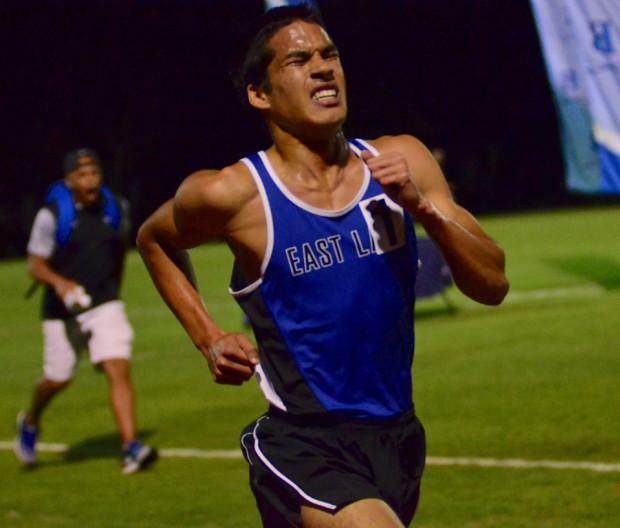 Capping off the day's individual events was East Lake's James Hasell winning the 3200m. Hasell was hasselled by both Robinson's Ethan Geiger and Clearwater's Cormac Gilmore but neither could get closer than a few strides behind Hasell. Hasell ran a negative split over his second mile of the race and finished with a meet record and personal best 9:38.81. Geiger won the battle for second over Gilmore 9:52.79 to 9:57.68. Plant's Walker Thomas was a close fourth in 9:59.85. The night cap saw host Berkeley win the 4x400m relay in 4:07.47, Davis on anchor and the East Lake boys led by Bowers win in meet record time of 3:29.03.